We can build to print or design & build dial/digital indicator or electronic column fixture gages to check a wide range of features and/or sizes. Complete concept drawings with quotes. With our engineering staff, we can manage a complete gaging package order. We have developed cooperative alliances with other shops to ensure that we provide the best functional product for the most reliable delivery. 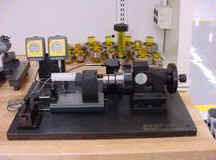 Our skilled tool and gage makers are all trained in the latest applications and interpretations of G.D.&T. standards. Customer prints with G.D.&T. notes actually save time and money when they come to purchasing gages, because these notes are the road map to making gages or check fixtures. Go/No-go gages are still needed for those less critical features that need to be verified in a cost efficient form. We build functional fixture gages as well to check max material type G.D.&T. notes. Precision and location are the keys to a good gage. With our Moore jig grinders, and Precision Parker surface grinders, we are capable of manufacturing gages within +/-.00005″. We can help you with budgets, gage matrix layouts, conceptions, and special applications standards. (Make sure each bid includes ALL you need from the start).